Hot Damn I’m in a Headstand! Those were the words I uttered (hollered) when I pulled my knees to my chest and pushed my feet into the air all on my own for the first time. Appropriately so, because I was in hot yoga. Hot damn, indeed. Since then I feel the need to do headstands at any given opportunity. I was working on (the very inkling of a thought of beginning) handstands with my mentor on Friday and so of course we took the opportunity to snap a photo of my leaning tower of headstand. I didn’t realize i leaned until I looked at the picture, but whatever people, it’s progress! Check it out. 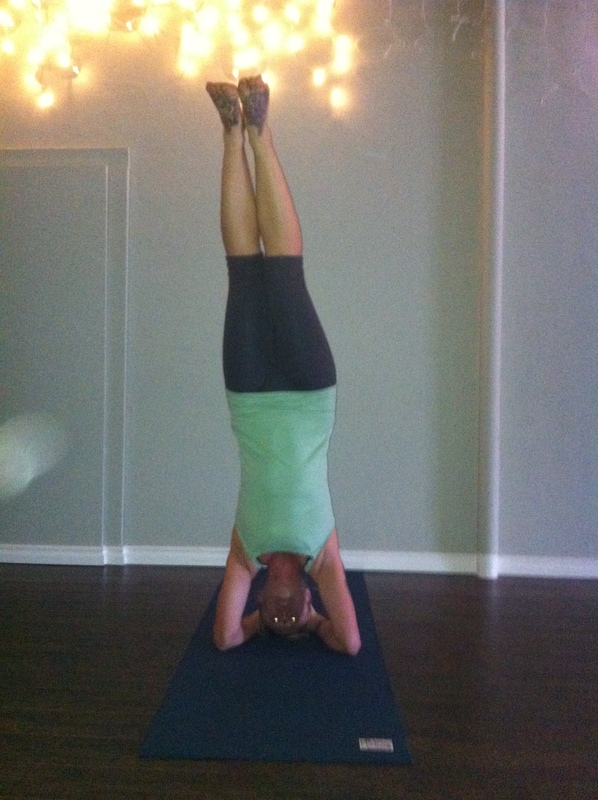 Ignore my demon eyes, I just want ya’ll to know I can do a headstand. 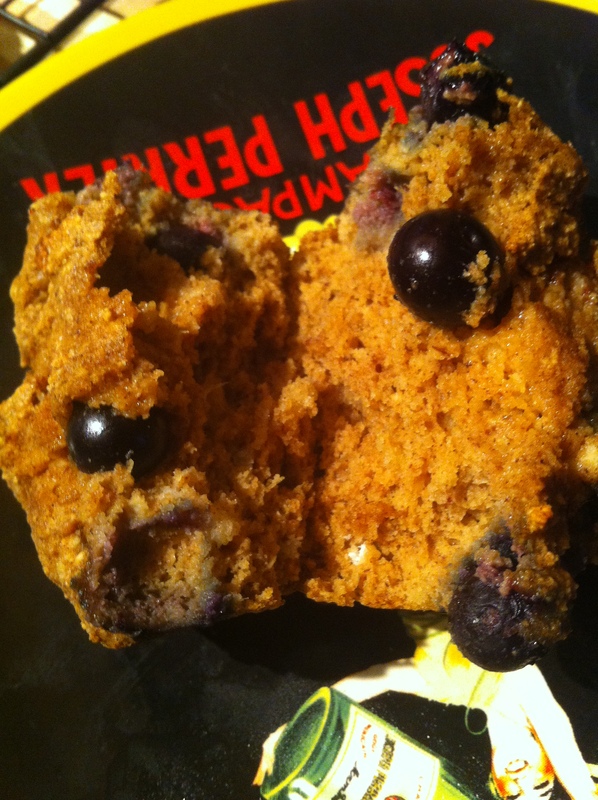 Onto more delicious things, like muffins. 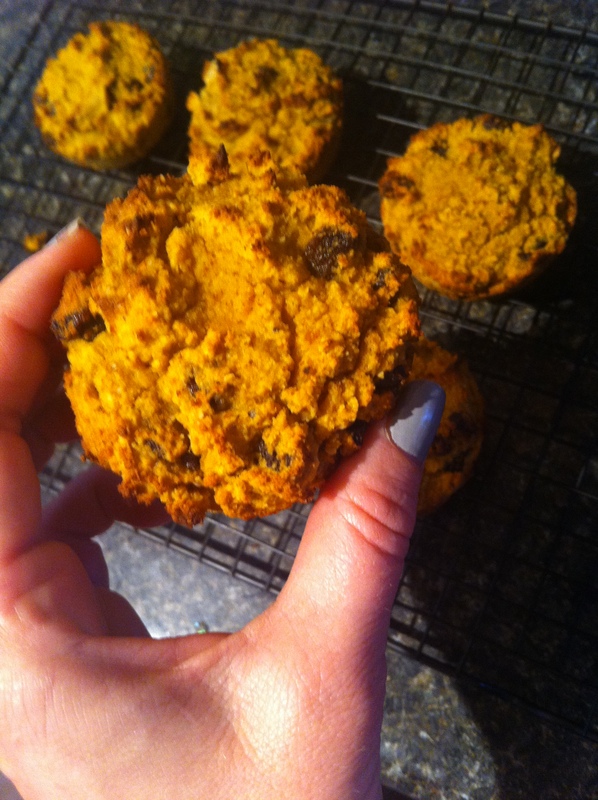 When I went Paleo I had this idea that I was never going to eat baked goods again. Ha! All I’ve really done is perfected Paleo baking. No, not really. Because my muffins the other day were a pancake recipe gone wrong. I was out of bananas, so I used pumpkin puree instead. Should work, right? Yes, unless you accidentally add an extra tablespoon of coconut flour, and then realize you have no coconut milk. EFF!!! So I sat, looking forlornly at my much too thick pancake batter, wondering what the hell we were going to eat for breakfast. Then it dawned on me. Muffin batter is really just thick pancake batter that rises, right? So I added some baking soda and put that batter in my super-see-duper awesome silicon muffin pans. Is it still a pan if it’s silicon? Hmmm. This is what went in ’em. Mix together everything but raisins, I used my hand mixer. Fold in raisins. 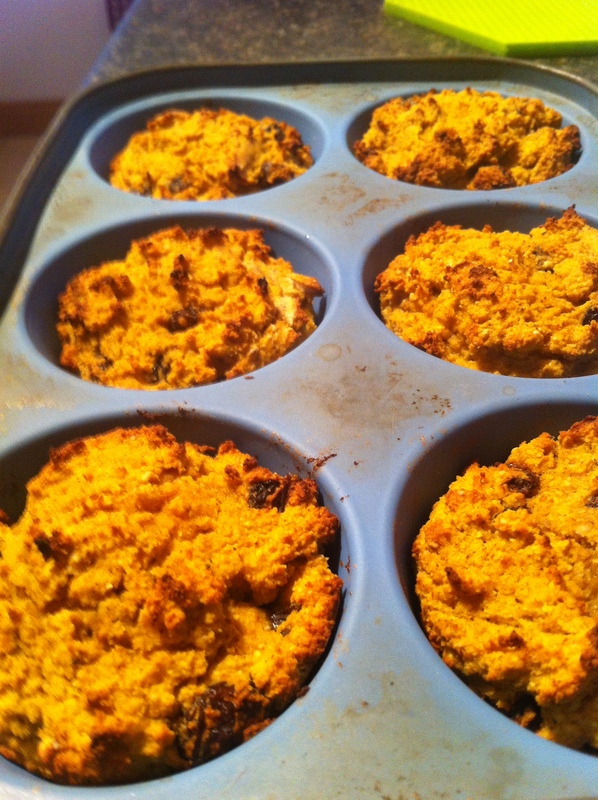 Grease muffin tin with coconut oil or use muffin cups. Divide evenly into muffin tin. Bake at 375 for 10 minutes. When the tiny peaks are starting to brown like in the pic above, they’re done. Know what I did next? Threw some grassfed butter on that bad boy and gobbled it up. Ok maybe I gobbled three up. Details, whatev. 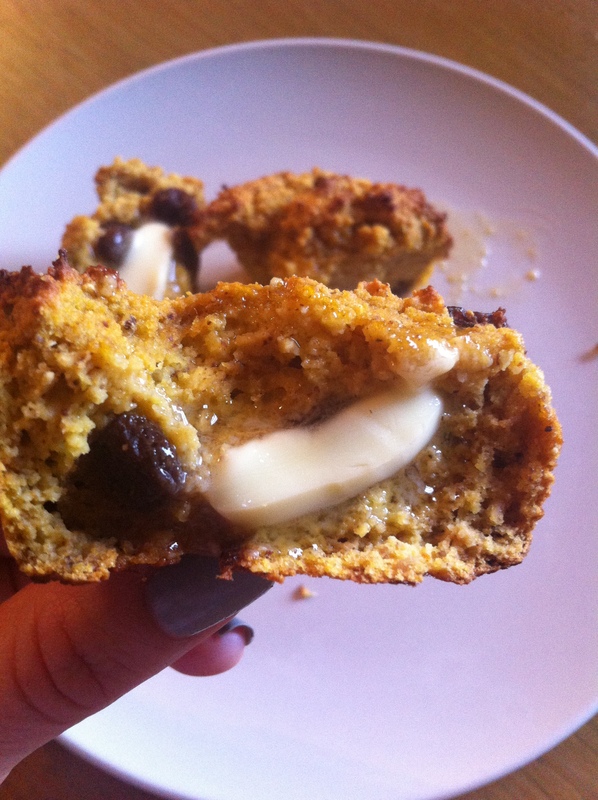 Same as with the pumpkin muffins, mix it all together sans blueberries. 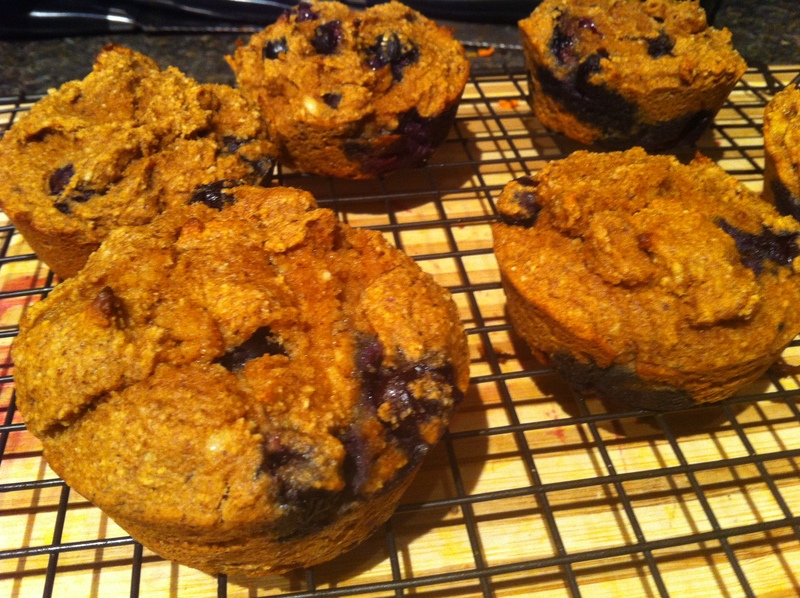 Fold in the blueberries, and put them into greased muffin tins (or use paper muffin cups). Bake at 375 for ten or so minutes. I should have made a double batch of these. The fresh blueberries really made the difference. Next time i’m thinking some coffee and chocolate chunks will be appropriate mix ins!